I'm not a big proponent of new year's resolutions. Personally, the flip from December 31 to January 1 does not invoke in me the need to assess life and make changes. Usually, other catalysts make that happen at more natural points in my life. I'm not saying that people who use the new year as a turning point in their life are incorrect; it's simply not effective for me. I need more than January first coming around to propel changes. Similarly, choosing a word for the year is not an effective tool for me. I tend to float along in my life happily, until I'm not happy or until it becomes clear change is needed. At that point, I work toward a goal that I've determined is the best coarse. 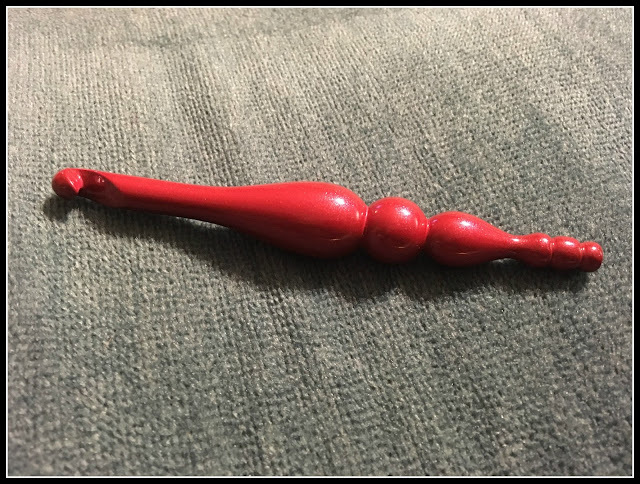 My new Furls crochet hook - and it feels so nice in my hand. In late 2017 I came to a realization that I needed to slow down. Sjorgren's is currently winning and my body is not happy most days. I'm failing at simple, basic daily tasks that we need to function at home - like making healthy meals. Although slowing down isn't exactly quite enough. I'm not the type of person that can sit still and be without projects, so I needed to come to an understanding of my varying limitations. After mentally dissecting my daily life and my attitude toward Sjogren's, I came to see that I honestly have no resting periods except night time sleep. Even if I sit down, I'm still mentally planning or working on things - online or on paper. I'm always doing something that tires out my brain and body. I've also tended to ignore that I have an autoimmune disease (or two or three...). I've spent so much time concentrating on Amber and her illnesses: working on medical solutions, helping her come to terms with her conditions, and ensuring she has the proper mental support. Amber has hobbies to keep her active and her mind engaged that I fully support and encourage. Even though he works all day, Fred also has hobbies he enjoys and regularly spends time engaged in. However, I have hobbies I rarely work on, unless the hobby coincides with another project or need. It's a rare thing for me to simply relax with a hobby. 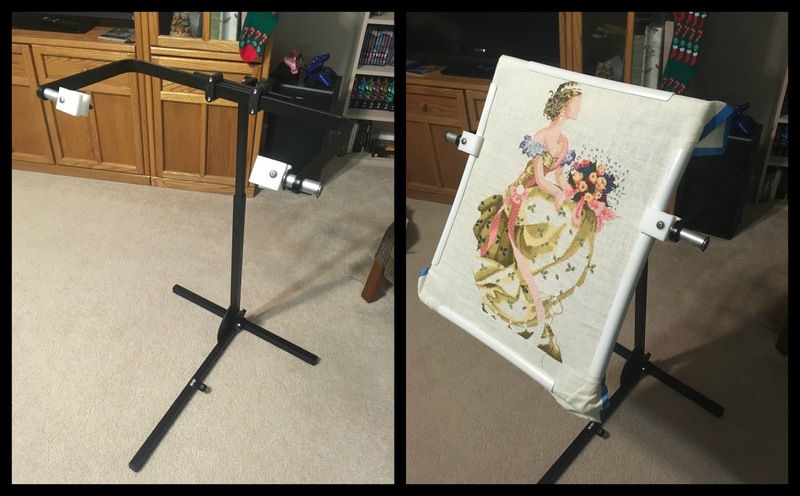 My brand new, Needlework System 4 floor stand. It hurt too much to hold my embroidery and still stitch. Unfortunately, I use q-snaps as opposed to scrolls or hoops, which made it difficult to find a stand. That telling fact is where I started. We took a nice break from school in December during which I picked up some of my old hobbies when possible. I even let a few things slide in order to sit and crochet. My computers were turned on for specific tasks only, instead of being turned on by default each day. The last few weeks haven't been perfect, but I'm feeling more relaxed even while having a Sjogren's flare. My goal is to be more mindful in relaxing with my hobbies: reading, crochet, cross stitch, and even video games with Amber. There are going to need to be other changes because of my health, although my doctors are still working that all out. However, relaxation and restful living will hopefully go along way to helping my body and mind heal. Fred and Amber have been lovingly supportive, and encourage me often to take time for myself, no matter how guilty I feel for not being busy with household tasks every waking moment. It turns out, both of them are rather willing to take on a few additional items around the house that I always felt were my job and I shouldn't ask for help with my jobs. I even received some fun cross stitch and crochet tools for Christmas that will make it easier for me to enjoy my hobbies without pain. I couldn't be more thankful for what my family had done to support my life changes. Even though I'm not one for new year's resolution, it seems my goal of a more relaxed attitude does somewhat coincide with the start of 2018. So, for once it seems I have a new year's resolution, of sorts. 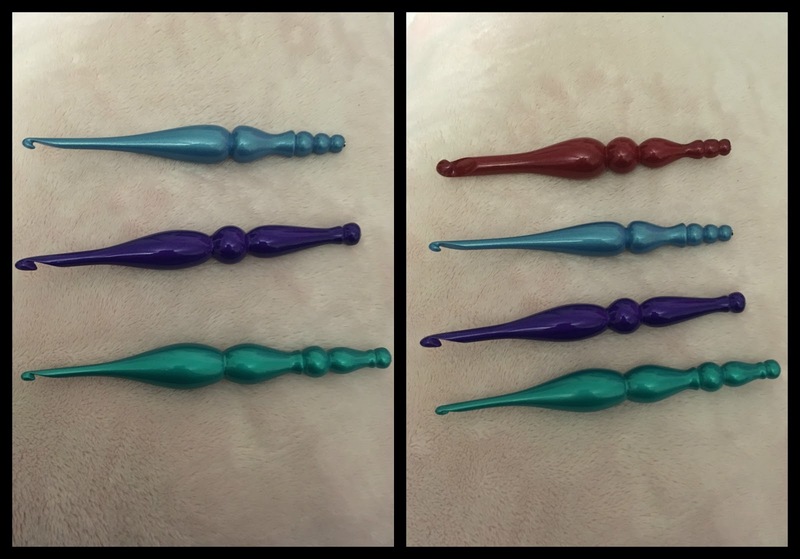 I loved my Furls hook so much that Fred urged me to order more of them. Furls is still sold out of some of the Candy Shop line after all the Christmas orders, so I'm waiting for a couple more sizes to be available. But look at these lovely hooks that do not hurt my hand or wrists! i am so happy to hear you have found a way to help your brain and body chill out. A very good thing that!